A key element in the Jeet Kune Do arsenal, the straight punch is a deceptively simple technique that Bruce Lee described as the most difficult move in Jeet Kune Do- "Only one in 10,000 can handle it." 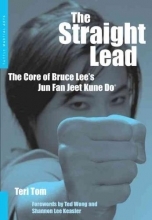 "The Straight Lead" describes the development of the straight punch in Western martial arts and describes Lee's refinement of the technique. It also offers a thorough instruction in the complexity and power of the move-showing martial artists of any discipline how to incorporate this devastating attack into their repertoire.